As our first term draws to an end excitement is filling the air as the children eagerly anticipate Christmas and all of its magic. 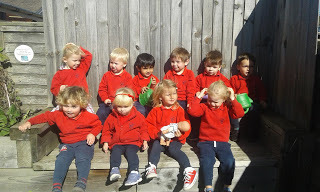 In Nursery the children have completed their ‘All About Me’ books and have settled well into their new routines and they have been enjoying the mild autumnal weather thanks to lots of outdoor play. In Pre School the children have explored two topics; ‘Family Fortunes’ and ‘Come and Join the Celebration’. At the start of the term the children talked about themselves, their families and their homes, they created pizza faces and gave wonderfully varied answers when asked what they want to be when they grow up! More recently, both classes have been thinking about different types of celebrations, and all children learnt about firework safety when celebrating Diwali and Bonfire Night. There was much excitement as Teddy celebrated his birthday and the children behaved beautifully when we welcomed a visitor in to the classroom to discuss Remembrance. At Forest School, the children have learnt their boundaries and fire square safety routines. They have discovered sleeping dragon tails, collected blackberries and have been using the bow saw to make wooden Christmas decorations. In Nursery the children have also been busy making some very special Christmas creations to take home, which hopefully by now you have been presented with! Next term, we will introduce the Pre School children to the Read Write Inc. programme which has proved to be very effective in promoting reading and writing in the Reception classes. We will continue to strive to provide a happy, safe and stimulating learning environment for all of our Nursery and Pre School children, helping them all to achieve and succeed. Finally, I would like to take this opportunity to wish all of our Nursery and Pre School staff, parents and children a restful and peaceful Christmas and a very happy new year. 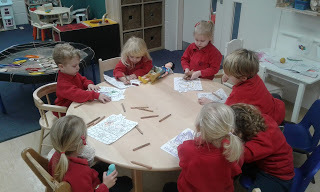 A BUSY TIME IN NURSERY! We were thrilled with how the children settled into their routines and have been venturing further afield. The children enjoy their walks around the school grounds and especially enjoy visiting the vast array of Copthill animals we find along the way! As you know we operate an open-door policy and if you have any concerns, no matter how small, please ask at drop off or email myself or your child’s keyworker when we will be pleased to help. We have been starting to learn our Christmas songs and we were really looking forward to having our families in school for our Interactive Nativity Story. We haven't tried this before and for it to work we really appreciated your good help on the day! Costumes were provided for any little ones who would like to dress up and join in. 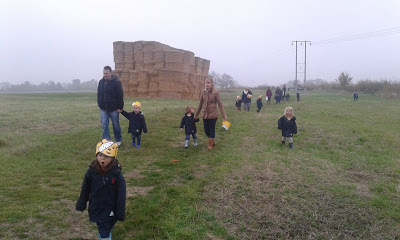 Thank you to everyone who took part in our Children in Need ramble. In the morning the children made special hats and talked about the importance of helping others. In the afternoon we all had a wonderful time walking along the river, across the field and in to the woods. The kitchen provided us with some lovely Pudsey Bear cakes to enjoy around the fire square. On the way back to school we stopped off to say hello to the donkeys, alpacas, sheep and hens. Thank you so much for your generous donations. 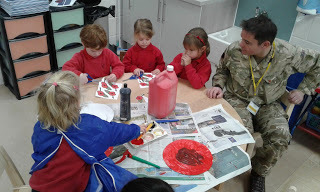 The children were joined by Major Leigh Fleming who spoke to the children about Remembrance, and watched a short animation to help them understand before joining in with some poppy making activities. The children were also given the opportunity to try on some Army uniforms.